RGV FC's Luis Gil tries to shoot the ball as Reno 1868 FC's James Kiffe defends during the second half of their game Wednesday, May 2, 2018, at H-E-B Park in Edinburg. 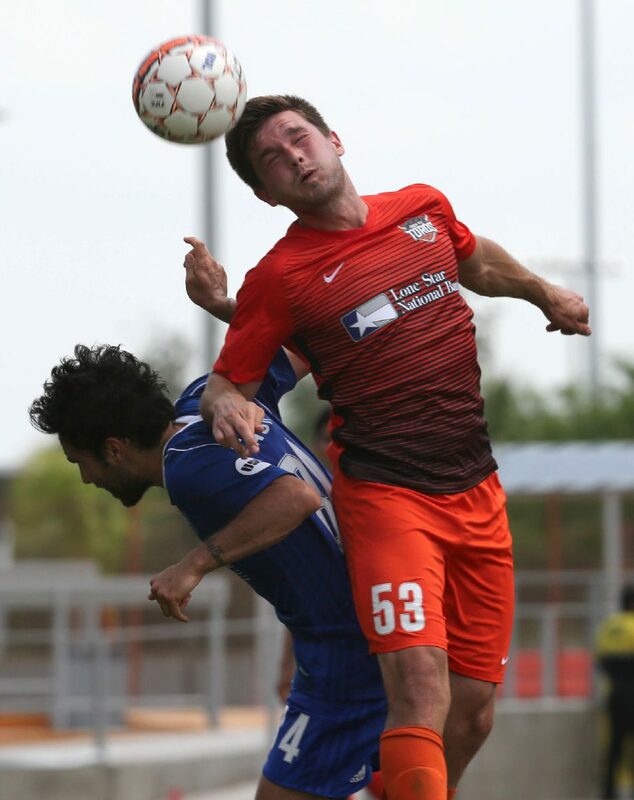 RGV FC ended the game 0-0. 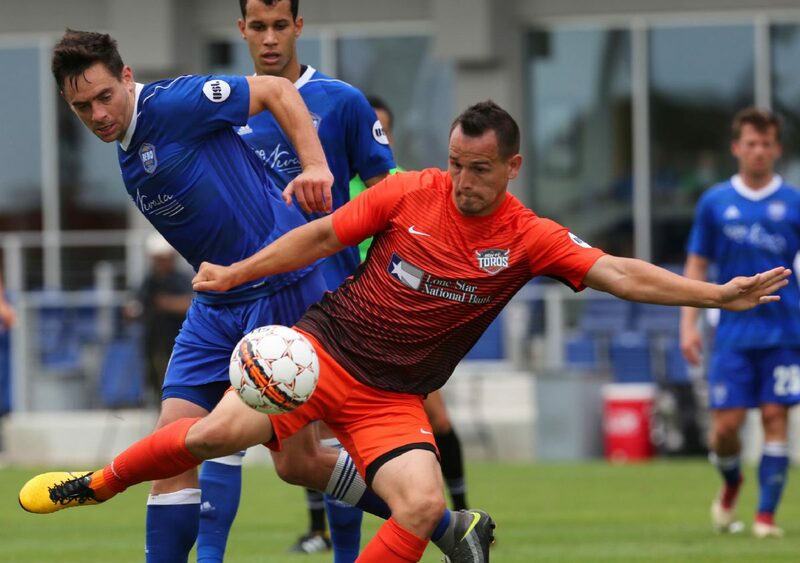 EDINBURG — On a day when RGV FC keeper Nico Corti made five critical saves to preserve a clean sheet, the moment that stuck with him the most was the one time the ball ended up in the back of his net. In the 30th minute, Reno 1868’s Antoine Hoppenot played a through ball to Lindo Mfeka, who found space on the right side of the penalty box. Corti charged forward and attempted a sliding challenge, giving Mfeka an opening to chip the ball into the goal as the referee’s whistle blew to signal offsides, negating the score. 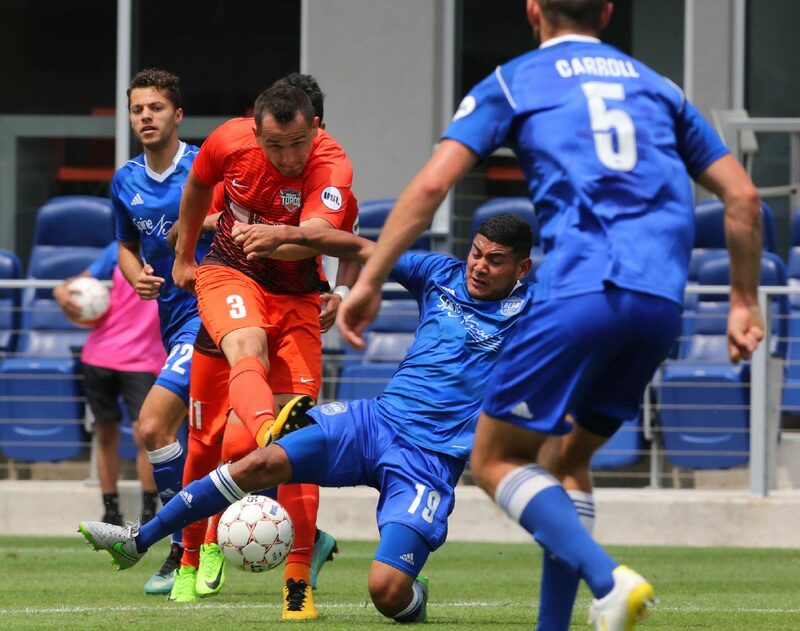 Corti was not beat again on Wednesday, helping the Toros (1-3-3) salvage a scoreless draw against Reno 1868 after an unusual 10:30 a.m. kickoff at H-E-B Park. 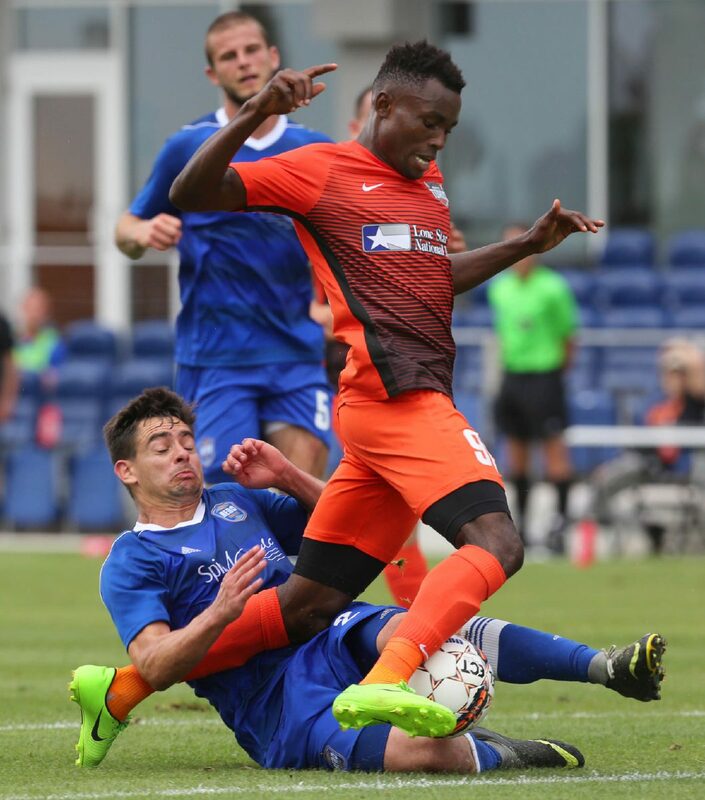 RGV FC's Monday Etim has the ball swept out from under him by Reno 1868 FC's James Kiffe during the second half of their game Wednesday, May 2, 2018, at H-E-B Park in Edinburg. RGV FC ended the game 0-0. 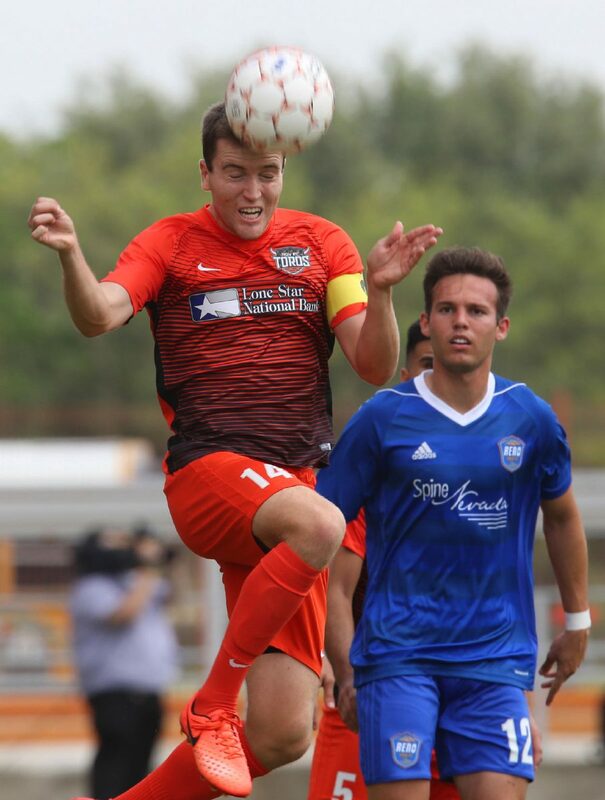 RGV FC's Eric Bird heads the ball against Reno 1868 FC's Seth Castle during the first half of their game Wednesday, May 2, 2018, at H-E-B Park in Edinburg. RGV FC ended the game 0-0. RGV FC's Luis Gil has his shot blocked by Reno 1868 FC's Kevin Partida during the second half of their game Wednesday, May 2, 2018, at H-E-B Park in Edinburg. RGV FC ended the game 0-0. When Hoppenot sent a shot toward goal from the right side of the penalty area in the 36th minute, Corti leaped to put his fingertips to the ball and deflect it up into the crossbar. In the 54th minute, Hoppenot launched another right-footed shot from the right side of the box, and this time Corti slid forward to kick the rolling attempt away with his left foot. Corti notched another critical stop in the 59th minute. After Kevin Partida’s initial shot from the top of the penalty box was blocked, Reno’s Brian Brown took control on the left side of the box and tested Corti from about 6 yards. Again, Corti made a sliding challenge to parry the shot with his legs. Echeverry praised Corti’s growth during the early stages of his first professional season following a four-year run at Stanford University that included three national championships. Corti has posted back-to-back clean sheets with a combined seven saves in his past two matches. Echeverry said Corti conceded some goals that “maybe he could’ve done a little better with” early in the season, allowing eight scores with just four saves during his first four matches with RGV. Corti’s outing kept the Toros even in a match played at a slow tempo in muggy conditions with temperatures around 90 degrees. Reno put five shots on target compared to the Toros’ two and held a 13-11 advantage in shots overall. Reno also owned a 5-0 margin in corner kicks and controlled 52.7 percent of possession. Bird said he was disappointed to misfire on his two looks at goal during the first 25 minutes, which were the Toros’ best offensive chances early. With the wind at its back, Reno took control of the game for the remainder of the first half. When the wind advantaged flipped in the second half, RGV was unable to pressure forward because of tired legs, Echeverry said. The Toros’ cleanest look at goal came in the 63rd minute, when Aldo Quintanilla dribbled in free on the right wing. He moved the ball to within about 6 yards of the net and then sent a low shot careening just wide of the near post.